Sterling Pool Service is a professional, family-owned, full-service pool company that provides pool maintenance, pool renovations and pool repairs. Sterling Pools has proudly served the Dallas Texas community for over 25 years with honesty, integrity, and reliability - taking care of both residential and commercial swimming pools. 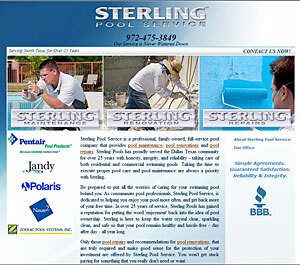 Taking the time to execute proper pool care and pool maintenance are always a priority with Sterling. Be prepared to put all the worries of caring for your swimming pool behind you. As consummate pool professionals, Sterling Pool Service, is dedicated to helping you enjoy your pool more often, and get back more of your free time. In over 25 years of service, Sterling Pools has gained a reputation for putting the word 'enjoyment' back into the idea of pool ownership. Sterling is here to keep the water crystal clear, sparkling clean, and safe so that your pool remains healthy and hassle-free - day after day - all year long. Only those pool repairs and recommendations for pool renovations, that are truly required and make good sense for the protection of your investment are offered by Sterling Pool Service. You won't get stuck paying for something that you really don't need or want. Your swimming pool is a major investment for relaxation, fun and fitness. Since cleanliness and water quality impact the enjoyment and health of every swimmer in your pool, not to mention the condition of the pool itself, why take chances with pool maintenance and pool care? Trust the professionals at Sterling Pool Service to take care of your pool for you. Find out more about what Sterling Pools can do for you by selecting Pool Maintenance, Pool Renovation, or Pool Repairs. You can also call 972-475-3849 for more information or Request An Appointment now. Grayson County Shelter - The Grayson County Shelter is a non-profit homeless shelter for displaced families which serves Grayson and surrounding counties in North Texas as well as the citizens of Southern Oklahoma. They provide private family rooms in a clean, safe, family environment. The Grayson County Shelter is open 24 hours a day, seven days per week. 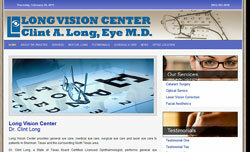 All services are provided free of charge to the clients. Please open your hearts in support of the services offered at the Grayson county Shelter. Your donation can be a tremendous help to give families and individuals a chance to become self-sufficient once again.